He argued that the cultural stuff is by far the most difficult. Using a gardening metaphor, he described culture as the ‘soil’, the technology as the plants. He called for a change to change mindsets, and two clashing mindsets (the superiority mindset, and the victim mindset) Schools that have one, or both, of these mindsets, have very big challenges in trying to improve. Superiority mindset is based on paternalism, competition and ‘standard-bearing’ (my construct is the best, and the only construct through which I define myself and others) THe victim mindset has irresponsibility, low motivation and low expectations of self. It was a good, aspirational, optimistic big-picture session. A great start to the day and not a gadget or gizmo in sight. This session will explore the connection between personal/ institutional mindsets and substantive change. Schools have historically had a difficult time changing with the needs of the society and the primary culprit is our thinking. Technology and innovation are only as effective as the mindset of the people who use them. At futurEducation I did take the opportunity to make some notes from a couple of the keynotes, which were both interesting. Dr Tom Wikman, from Finland, opened the conference and was disarmingly honest in his admission that he both was a bit sick of Pisa test discussion but also liked it (‘after all, it’s brought me here’). He opened with a gorgeous Finnish landscape shot, a bit like the one above. Wikman talked about Finnish education, the ‘Finnish Pisa machine’ he called it, and explained why Finnish results might be so high, even in comparison with ‘like’ countries such as their Nordic neighbours. One reason he pointed to, ironically, was the lack of reform in Finnish education, where education has been consistent and stable compared to other countries that have had multiple reforms over the last twenty years. The message: test less and reform less, and let teachers get on with it. But that’s if teachers are trusted as high quality, well esteemed, all with Masters Degrees and seen as teacher-researchers. His metaphor was the teacher as ‘conductor’ (as in conducting an orchestra)and described a surprisingly conservative and old-fashioned sounding education system: blackboards, kids in rows, textbooks, with an emphasis on ‘essentialism’ (the subject) rather than ‘progressivism’ (the child), and traditional in emphasis rather than future-orientated. Okay, it gets good test results in PISAS; can’t argue with that. 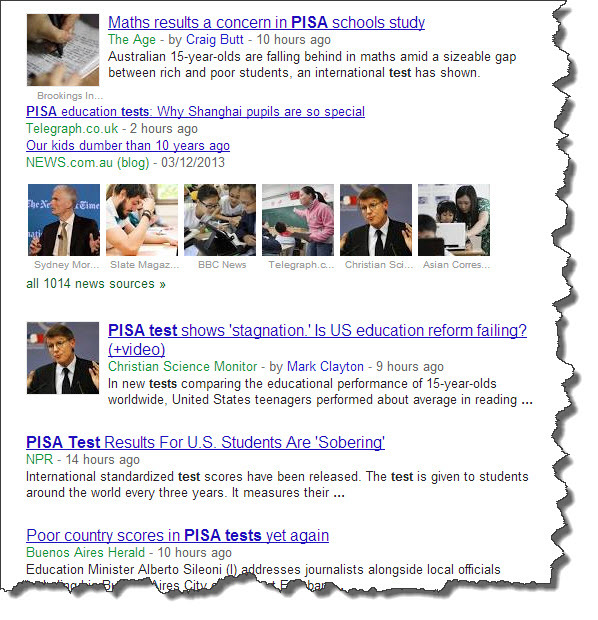 But, unquestioned in all this, it seemed to me, was the idea that tests like PISA do accurately measure what matters, just not what can be measured. I’m not sure that I’d go far as to endorse the (somewhat US-centric) view that PISA test results are inverse predictors of creativity or ingenuity or entrepreneurship, but I get the point. Everyone, from the PM down to the boys in the Gonkski-mobile seem to believe. And, after all Wikman’s talk about the status of teachers, the need for stability and the worth of trusting teachers, what’s the take-home message for Australian politicians? : test, test, test, and make teachers accountable. Hear this blog post read by a computer! 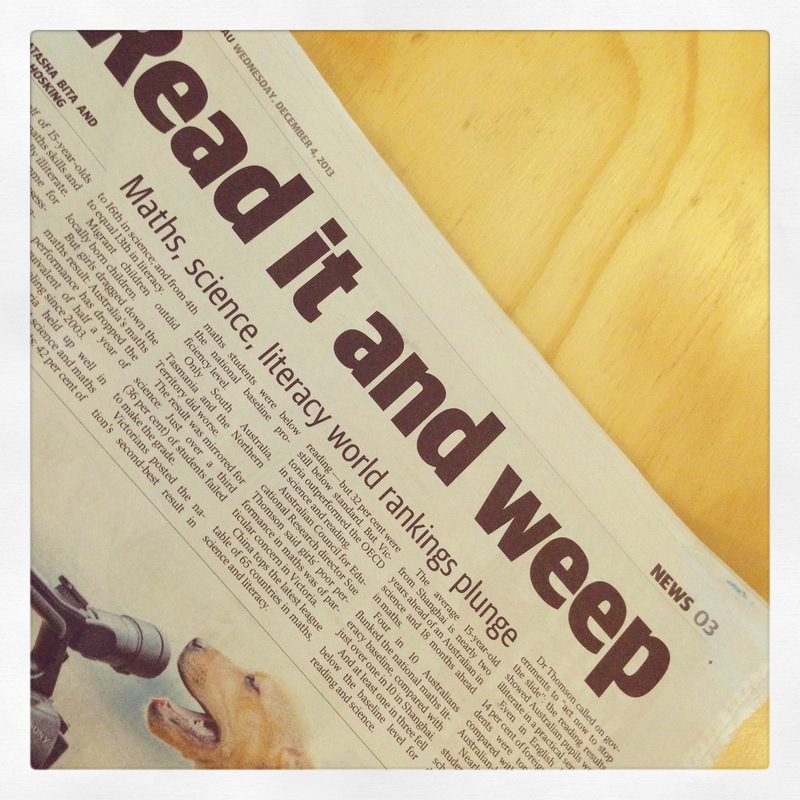 The Herald-Sun hasn’t waited long to get its teeth into the eduction debate about school achievement. The new MySchool website (which I blogged about late last year) was launched today, but it already doesn’t go far enough for the high standards of the Melbourne tabloid. I hope to talk more about this later, particularly Ms Gillard’s remarks that parents should ‘badger’ schools and teachers until they improve. Meanwhile, I reprint today’s editorial in full below. THIS morning, subject to the vagaries of technology, parents will be given information to help them make one of the most important decisions in their lives: where to send their children to school. Needless to say, it will also be one of the most important decisions in their children’s lives. It comes as fees at private schools are increasing and more parents are considering whether to send their children to a public school. But, cost aside, which school parents choose should be based on a range of priorities, which includes where a school ranks in academic performance. The My School website will allow parents to make some comparisons between schools within their immediate area. But it doesn’t go far enough. Many teachers and principals, as well as Education Minister Julia Gillard, think ranking schools will hurt underperforming schools. The opposite is the case. Government and teachers must ensure these schools improve, not hide their inadequacies. The argument that publishing so-called league tables will only stigmatise the poorer performing schools is a false one. Comparing the nation’s schools would make the Government and education authorities accountable. Parents themselves face an impossible task in forcing change at mediocre schools. They need to be able to point to the information provided by full disclosure of every school’s performance to demand improvement. The information on the My School website today is a significant move in the right direction, but falls short of clearly ranking the nation’s 10,000 schools. Tonight I finally got around to watching the 7.30 Report’s interview with Sir Kenneth Robinson that aired last week. (16/6) on ABC TV. Quite a few staff at school had seen it, and were talking about and it was worth looking at, both for his ideas about the importance of finding your passion and interest (and how schools didn’t do that well) and how the current trend towards testing narrowed the focus of schools, in a bad way. That first point is critical, and I’ve sometimes made it to parents when speaking at information evenings and curriculum nights: that it could be argued that the most important thing a school can do for a student is awaken in them their particular area of expertise and passion which will lead them forward. I’ve mentioned Robinson in this blog before so it was good to be able to see him interviewed in a two part presentation. You can see it too on the 7.30 Report site with video and audio.